If you are looking to get into the medical field or learn surgical instrumentation while working in a fun fast paced environment this is a great opportunity. Although experience in supply chain or inventory is preferred we will train an applicant who shows a desire to learn and excel in something new. JOB SUMMARY: To ensure all appropriate supplies and equipment are inventoried, received and distributed in accordance with proper and prudent practices. Education: A high school diploma is required. Experience: Previous experience is preferred. Job Skills & Requirements: Inventory handling, shipping and receiving. Working knowledge of computerized inventory procedures. Must be able to work in a high volume fast-paced environment. JOB RELATIONSHIPS: Is directly responsible to the Materials Manager. Does not supervise any other staff members. Mental: Ability to follow written and oral instructions, read and write and basic math. Stamina to withstand stress and strain. Good memory, patient and tactful. Skilled in organization. Physical: Good physical health required because of long periods of standing, walking and work required. Must be well coordinated and able to move about freely. Dexterity necessary. Visual and audio acuity. Speak clearly and distinctly. Neat, clean and particular about appearance. Must be able to continually stoop, bend and lift twenty-five (25) pounds and occasionally lift up to fifty (50) pounds. This is a full-time position Monday Through Friday. $14.00 per hour. Generous benefit package including quarterly cash bonus, 401K and over five weeks of paid time off in the first year! Internal Applicants submit letter of intent to Human Resources. For assistance or fill-able application please contact Human Resources via phone or come to our Reception Desk and ask to speak Human Resources. POSITION SUMMARY: The Central Sterile Processing Coordinator will supervise and oversee the department’s staff and daily operations. This position will be responsible for ensuring that compliance standards and performance goals are being met. Serves as a key leader and educator to the Central Sterile Processing Technicians. Assures proper decontamination, quality assurance, sterilization of equipment, and distribution of sterile surgical instrumentation. Education: A high school diploma or equivalent is required. Experience: Five (5) years of sterile processing experience in a hospital or multi-specialty surgery center. Preference to candidates with previous supervisory or management experience. Preference to candidates with previous experience with regulatory compliance and policies and procedures. Mental: Stamina to withstand stress and strain. Good memory, patient and tactful. Emotional stability. Able to both listen and direct. Skill in organization. Language skills: Ability to understand, read, write, and speak English. Ability to read, analyze, and interpret general business periodicals, professional journals, technical procedures, or governmental regulations. Ability to successfully write business correspondence. Ability to effectively present information, respond to questions, and professionally interact with managers, employees, clients, vendors, and the general public. Reasoning ability: Ability to recognize and define problems, collect data, establish facts, draw valid conclusions, and correct errors. Ability to interpret a variety of instructions and forms to understand abstract and concrete variables. Ability to think critically using inductive and deductive reasoning. JOB RELATIONSHIP: Is directly responsible to the Clinical Director. Supervises Sterile Processing Technicians. Works collaboratively with all levels of the healthcare team including: vendors, physicians, anesthesia, and staff. Full time 40 hour per week, Monday through Friday, no night or weekend shifts; paid holidays. Competitive benefit package, 401K contribution and over five weeks of paid time in the first year. Starting wage $29.00 per hour. JOB SUMMARY: Responsible for coordinating, monitoring, and maintaining the credentialing and re-credentialing process. Assists in facilitating all aspects of Bend Surgery credentialing, including initial appointment, reappointment, expirable process, as well as clinical privileging for Medical Staff, Allied Health Professionals, and all other providers outlined in the Medical Staff Bylaws and policies. Ensures interpretation and compliance with the appropriate accrediting and regulatory agencies, while developing and maintaining a working knowledge of the statutes and laws relating to credentialing. Responsible for the accuracy and integrity of the credentialing database system and related applications. Experience: One (1) to three (3) years previous experience medical staff credentialing required. Certification: NAMSS Certification as a Certified Professional Medical Services Manager (CPMSM) or Certified Provider Credentials Specialist (CPCS) or actively pursuing certification. Knowledge of medical credentialing and privileging procedures and standards. Ability to analyze, interpret and draw inferences from research findings, and prepare reports. Working knowledge of clinical and/or hospital operations and procedures. Ability to use independent judgment to manage and impart confidential information. Database management skills including querying, reporting, and document generation. Ability to make administrative/procedural decisions and judgments. This is a part time position, 20 hours per week. Schedule is flexible. $22.50 per hour. JOB SUMMARY: This professional provides planned and highly skilled nursing care for the immediate pre- and post-operative patient. Through continuous patient surveillance, allows for early recognition of medical or surgical complications, which may arise in any patient. Physical: Good physical health required because of long periods of standing, walking and work required. Must be well coordinated and able to move about freely. Dexterity necessary. Visual and audio acuity. Speak clearly and distinctly. Neat, clean and particular about appearance. Must be able to stoop, bend, push, pull and lift minimum of 25lbs frequently, 50lbs occasionally. Education & Licensure: Graduate of an accredited school of nursing and currently licensed to practice in the State as a Registered Nurse. Maintain current ACLS/BLS/PALS certification. Experience: Prefer previous general medical-surgical nursing experience. Prefer previous post anesthesia recovery experience. Adequate understanding of a wide variety of medical/surgical pathophysiology. Awareness of symptoms and possible complications of surgery and anesthesia and initial treatment and consequent nursing interventions. Knowledge should be up-to-date on the actions of all pharmaceuticals and anesthetic agents. Have a working knowledge of fluid and electrolyte balance. Able to perform accurate and complete patient assessments throughout the peri-operative period. For assistance or fill-able application please contact Human Resources via phone or come to our Reception Desk and ask to speak Human Resources. Application deadline April 12, 2019. JOB SUMMARY: Oversees the design of and fosters an approach to, continuously improving quality. Establishes quality improvement responsibilities in the organization and sets strategic priorities for quality assessment and improvement. Reviews and analyzes all elements of Quality Assurance (QA) and Improving Organizational Performance (IOP) programs. Leads QA/IOP Committee. Reports to the Medical Advisory Committee activities of the QA/IOP Programs. Rarely stoop, kneel, crouch, lift, carry, push or pull 11-15 pounds. Education & Licensure: Graduate of an accredited school of nursing and currently licensed to practice in the State as a Registered Nurse. Experience: Must have working knowledge of Quality Assurance (QA), Continuous Quality Improvement (CQI) and Performance Improvement (PI) programs as well as state and federal regulations regarding ambulatory Surgery Centers (ASC’s) and accreditation standards. Experience in related area of Quality improvement in the medical field will be accepted. Comprehensive and current knowledge of nursing theory and perioperative nursing care in the ambulatory surgery unit. Adequate understanding of a wide variety of medical/surgical pathophysiology, operative procedure and required patient preparations. Thorough knowledge of and ability to implement principles of aseptic technique. Understanding of proper positioning techniques, anesthesia and anesthetic agents effects. Knowledge of surgical procedures, techniques, symptoms and complications of surgery, anesthesia and consequent nursing interventions. Knowledge of actions of pharmaceuticals and anesthetic agents. Able to recognize emergency situations and assist in corrective actions. Have a working knowledge of fluid and electrolyte balances. Knowledge of the policies, procedures, philosophies, standards, goals and objectives of ambulatory surgery; especially those pertaining to the operating/procedure rooms. Dresses within the dress code requirements of the facility. JOB RELATIONSHIPS: Directly reports to Clinical Director. Does not supervise any other staff. This position will primarily function as Patient Care Support and be trained to fill in as needed as an Endoscopy Technician. Functions as an assistant to the registered professional nurse as directed, but limited to instruments, equipment, supplies and patient transport. Directly responsible for keeping the facility neat, clean and tidy to inspection. Supports Physician and nursing staff to provide individualized and specialized care to patients in the endoscopy area. Functions cooperatively with physician and staff exhibiting teamwork characteristics in decision-making process. Experience: Previous experience is desirable, but not required. GI experience preferred. Job Skills & Requirements: Completion of the specific orientation and on-the-job training program is essential. Must develop methods for work organization and interpersonal relationship skills. Mental: Stamina to withstand stress and strain. Good memory, patient and tactful. Emotional stability. Able to both listen and direct. Skilled in organization. Position details: This is a full-time position Monday Through Friday. Complete benefit package including quarterly cash bonus and 401K. Base hourly wage $15.00 per hour. Responsible for the cleaning, packaging, sterilizing and storing of supplies, instruments and equipment. Experience: Previous experience in processing surgical instruments is required or demonstrated ability in sterilization techniques with a thorough knowledge of instrumentation, care and handling. Certification: Sterile Processing Certification required. Ability to obtain certification within one year with completion of the specific orientation and on-the-job training program will be accepted in lieu of certification for a strong candidate who meets all other qualifications. This is a full-time position Monday Through Friday. Generous benefit package including quarterly cash bonus, 401K and over five weeks paid time off in first year. Starting base hourly wage $15.00-$20.97 DOE. Bend Surgery Center now offers an online Medical History form that allows patients to complete their Pre-Operative Questionnaire and Medical Reconciliation form online prior to surgery. Patients can complete the secure web form wherever from any computer or mobile device. The information gathered during this process allows Bend Surgery Center to provide the best possible care for their patients. You will find a convenient link from the Bend Surgery Center website under patient forms. The 8th Annual Umpqua Bank BandTogether for Scholarships Benefit will be held at the Tower Theatre on Thursday, October 5th. Come enjoy a fun evening at the Tower Theatre while helping to raise scholarships for local students pursuing careers in healthcare. 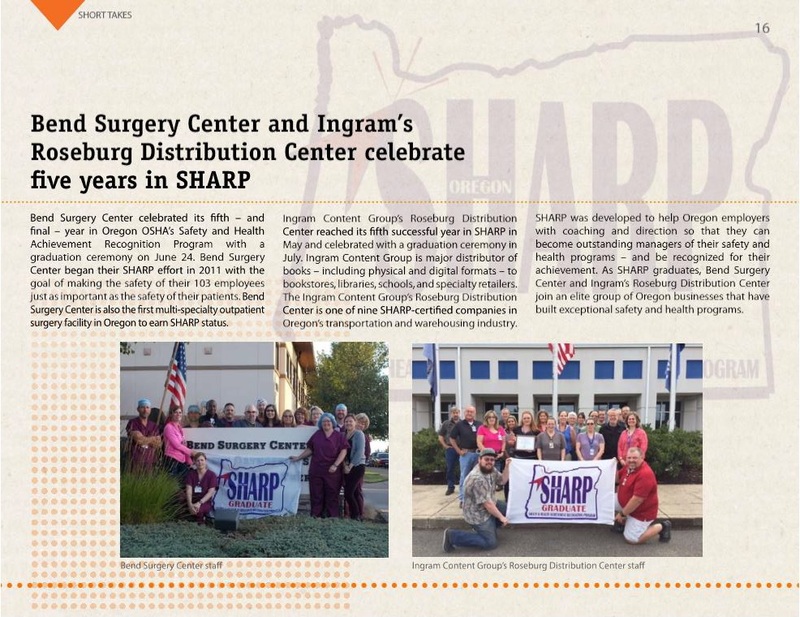 Bend Surgery Center wins SHARP Recognition for 5th year!